The imitations done by the Marxes in the Theatrical Agency-skit was changed over the years in various performances of On The Balcony and I'll Say She Is, alternating between the stuttering comedian Joe Frisco and their uncle Al Shean and his partner Ed Gallagher. According to Glenn Mitchell in The Marx Brothers Encyclopedia, this was intended to satirize a popular trend, for in 1921 Gallagher and Shean impressionists had proliferated to the point where Keith's Circuit issued an edict limiting such impersonations to one per night. As cousins of Al Shean, the young Hamburg sisters of The New York Wonder Kiddies reportedly had the only rights to sing the original verses of Mr Gallagher and Mr Shean as they were used in the Follies. 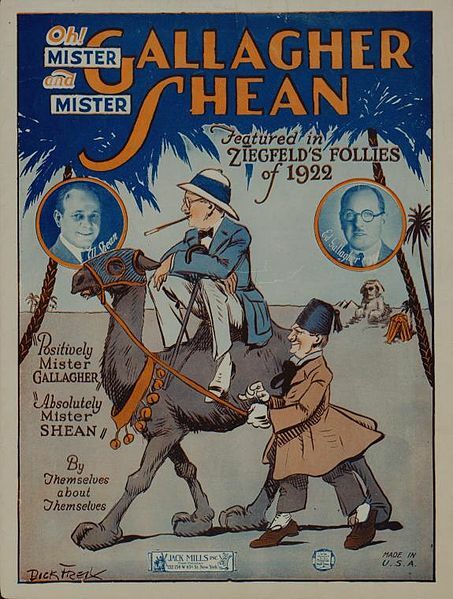 Al Shean, born Adolph Schönberg and younger brother of the Marx Brothers' mother Minnie, was together with Edward Gallagher one of most famous male teams in Vaudeville. Their popularity was based on the strength of the self named song Mr Gallagher and Mr Shean. It was introduced in 1921 and was the hit number of the Ziegfeld Follies of 1922. 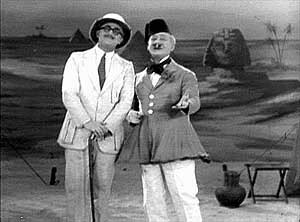 Gallagher and Shean's signature costumes came from the Follies number which was set in Egypt, reflecting the "Egyptian craze" of the early 1920s that was also evident in early I'll Say She Is-numbers like In The Sheik's Tent and The Wonderful Nile. Gallagher and Shean supposedly never sang the song the same way twice. In the 1960s, Groucho did an update of the song with Jackie Gleason, Mr. Gleason and Mr. Marx. For some time, Gallagher and Shean was also a daily comic strip with the dialogue designed as a verse of the song. Shean Statue of Liberty, Mr Gallagher? Gallagher Coney Island, Mr. Shean! Shean Oh, Mr. Gallagher. Oh, Mister Gallagher! Gallagher Oh Mr. Shean. Oh Mr. Shean! Gallagher I forget it Mr. Shean! Shean Oh, Mr. Gallagher! Oh, Mister Gallagher! Gallagher Hello, what's on your mind this morning, Mr. Shean? Gallagher Why, Mr. Shean. Why, Mr. Shean! Shean Oh, that's silly Mr. Gallagher! Shean Oh, Mr. Gallagher. Oh, Mr. Gallagher! If you're a friend of mine you'll lend me a couple of bucks! I'm so clean you'd think that I was washed in Lux! Gallagher Oh, Mr. Shean. Oh, Mr. Shean! Do you mean to say you haven't got a bean? I intended touching you for five! Shean Oh I thank you Mr. Gallagher! Gallagher You are welcome, Mr. Shean! Shean Oh Mr. Gallagher! Oh, Mr. Gallagher! Once I think I saw you save a lady's life! Gallagher Oh, Mr. Shean! Oh, Mr. Shean! As she sunk I dove down like a submarine! Shean Who, the lady Mr. Gallagher? Gallagher No! The rowboat, Mr. Shean! Shean Oh, Mr. Gallagher! Oh, Mr. Gallagher! What's the name of the game they play upon the links? Where you can't find it at all? And the caddie walks around and thinks and thinks? Shean Sure 'tis croquet, Mr. Gallagher? Gallagher No! Lawn tennis, Mr. Shean! I was wondering why did you come here alone? Was your married life all right? Look at that black eye Mr. Gallagher! Gallagher Look at this one, Mr. Shean! Shean That's why I'm here, Mr. Gallagher! Gallagher That's why I'm here, Mr. Shean!